It seems like forever since I have done a home tour. 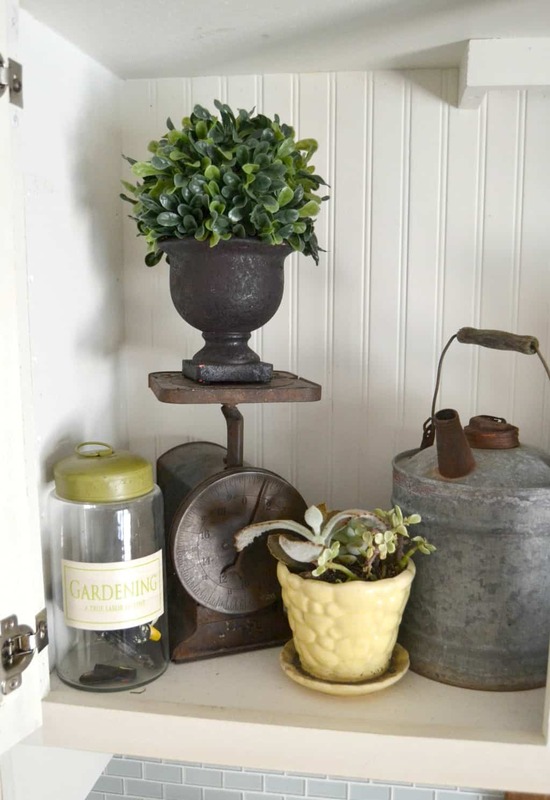 When Meg from Green With Decor asked if I would like to join them on this Summer Home Tour 2016, I jumped right on board. For summer, our home is decorated simply. There is nothing fussy or fancy about it and I don’t spend a lot of time over-analyzing things. 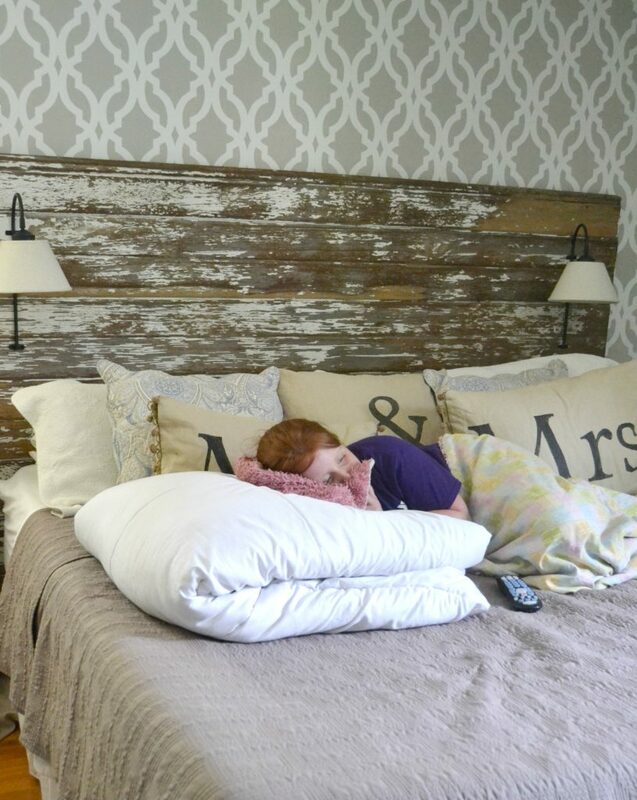 I want our home to be cozy, welcoming and comfortable all year, but in the summer, I really want it to be laid back and a place for our guests and us to relax and unwind in. For the living room, I took the bench out of our back porch and moved it in here for the summer. I found the old quilts recently and had to put them in here. 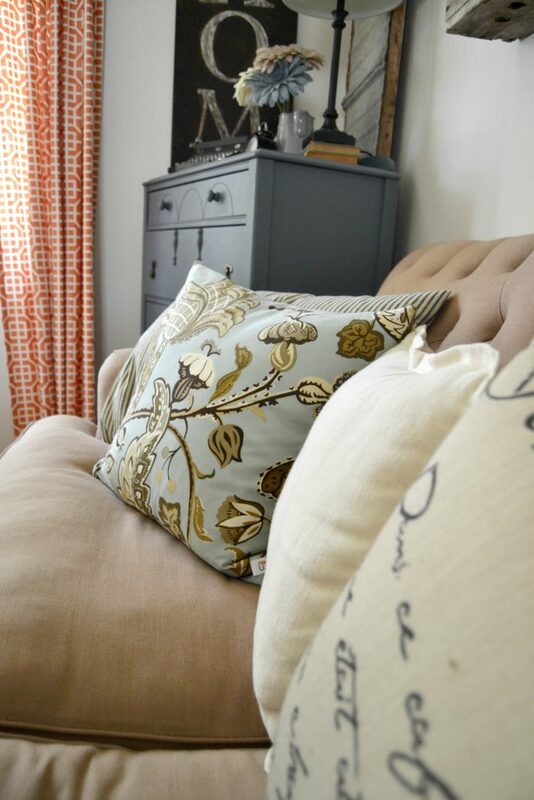 Their colors are great and we will actually use them to curl up on the couch with. I get a lot of questions about our sofa. I found it at TJ Maxx on final clearance. I got it at an UNBELIEVABLE price. I want to do a “Where Did She Get It” post that will share where I got the pieces in our home and how much I spent on them. (You will be amazed how frugal I really am. 😉 ) If you like our sofa, I did write a post about sofas and found one very similar to ours. Find it HERE. 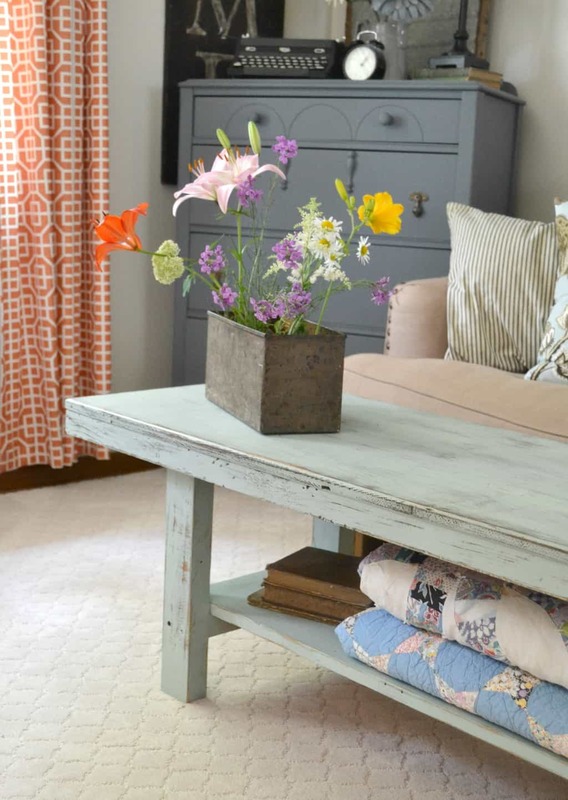 My favorite thing about decorating for a summer home is having an endless supply of flowers to bring inside. They brighten every room we put them in. I mean…… look at these beauties!!! I took this exact picture last year. Things change fast around here. This is my desk for the time being. 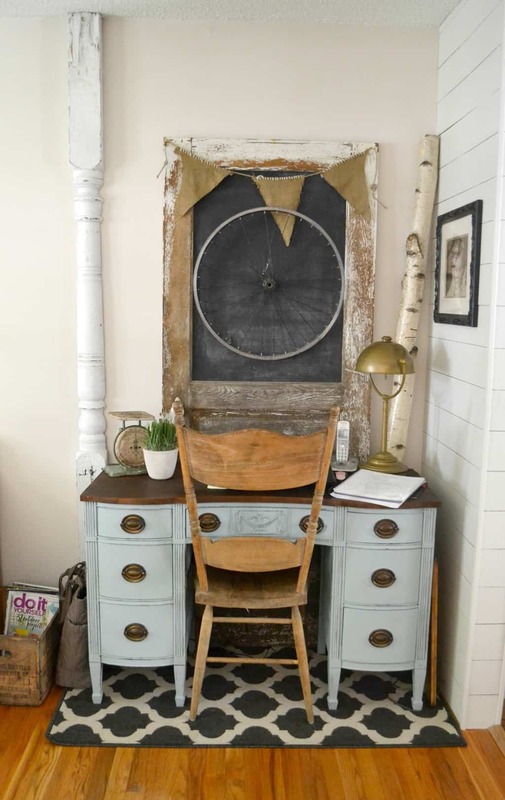 I have made some big changes recently and we are pretty sure I am going to have to make a “proper” office in our guest bedroom. I need more space to spread out. This desk area will probably remain here thought because it is a great space for the family computer. Even a fake plant adds life to my desk. 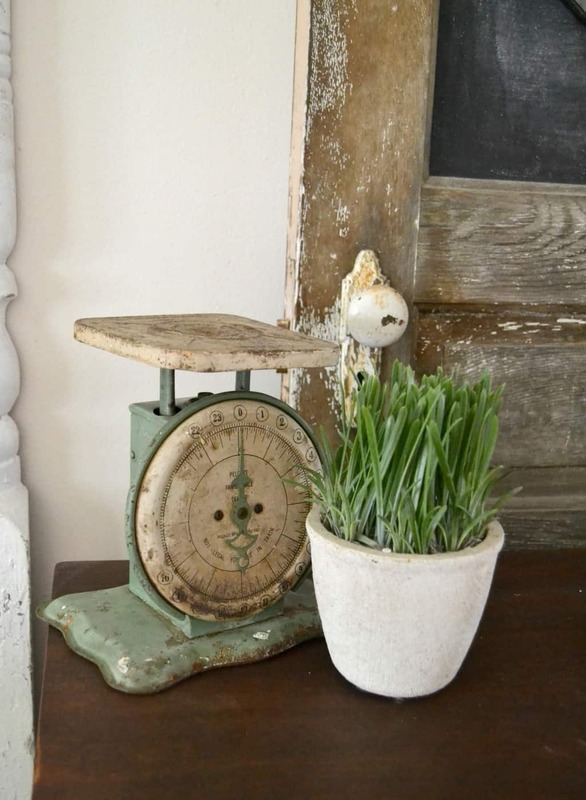 It is the little things that can make the biggest difference in summer home decorating. I have been pinning things to this wheel all year, but this summer, I wanted it blank. The simpler, the better. When we added the built-ins in our dining room, it gave me a fun spot to decorate as the seasons change. A lot of times, this is the area I decorate first when I want to change things up. Our back porch was a “much-needed” addition a few years ago. This year, we want to make some fun changes in here. We had plans for a wall treatment, but that didn’t work out so now I am working on a Plan B. 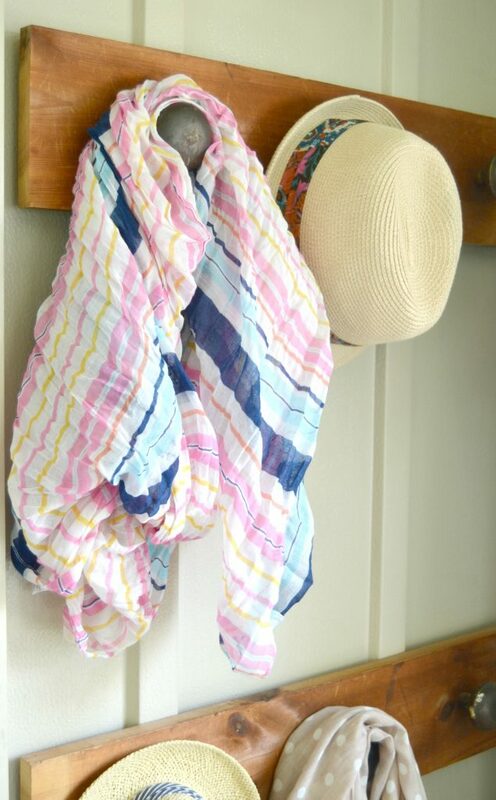 Our summer hats and scarves hang in our back porch so they are easy to grab as we are walking out the door. 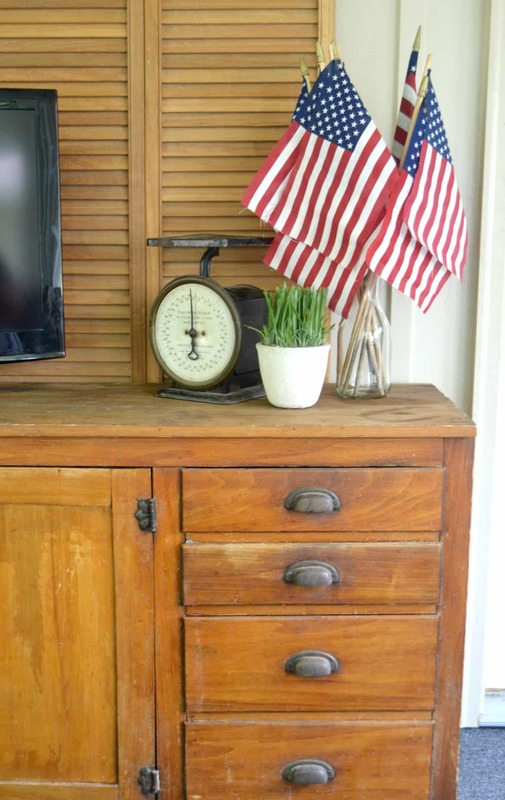 A group of flags in a vase is all I need for a summer home tour. 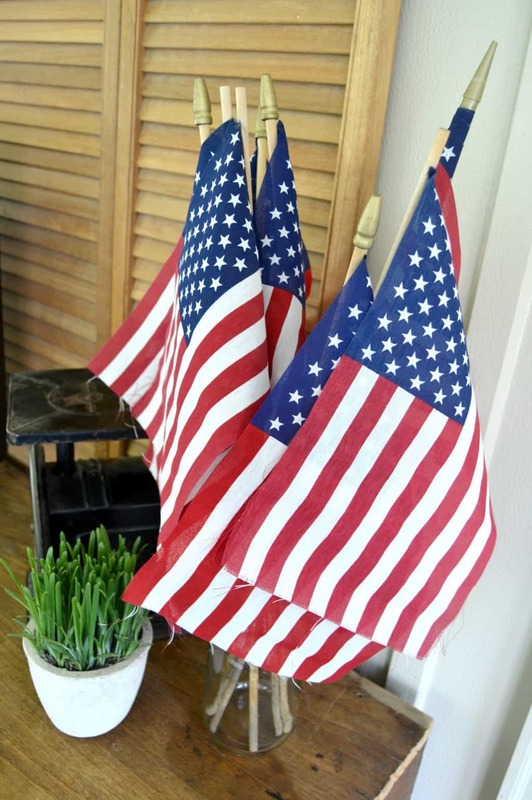 The American flag goes with every season, but in the summer, I like to add just a little more patriotic flair here and there. 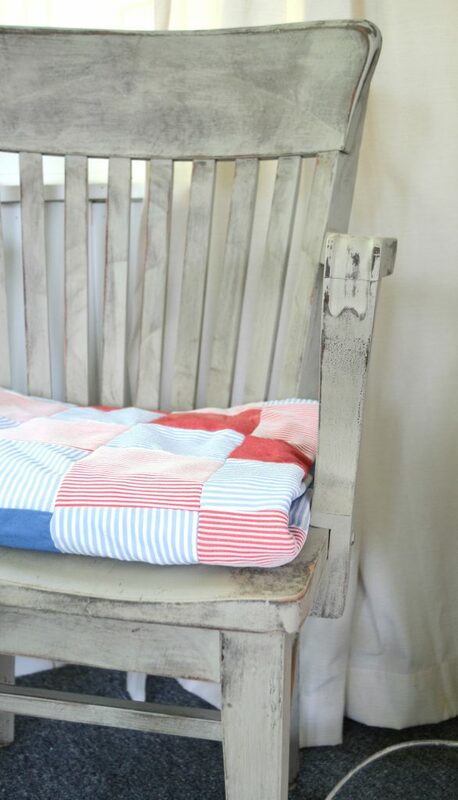 The homemade quilt goes well with the American vibe in our porch. I laid on an old chair I painted and it is easy to grab when we want to eat lunch on the lawn. 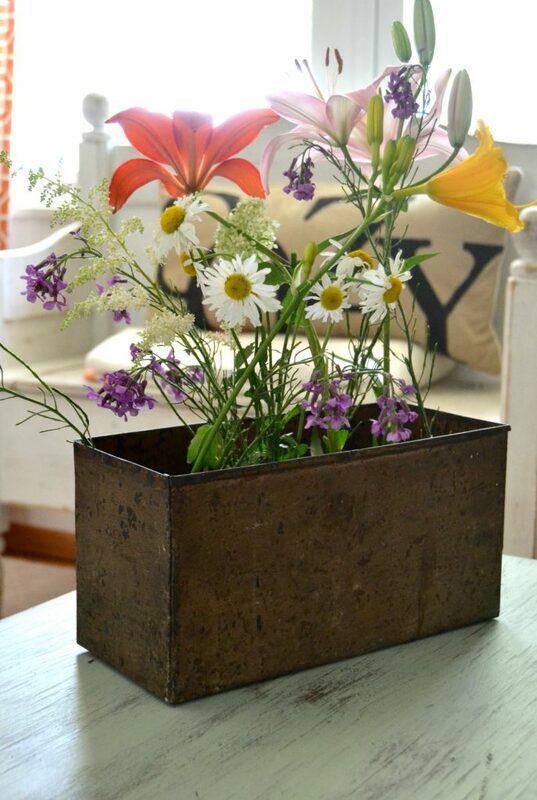 I put an empty vase in the basket because my daughter picks flowers a lot. She is always asking for a vase and this way, she has one ready and waiting for her when she needs it. If I could capture this time with her and bottle it, I would. It is going by way too fast. The picture below wraps up the entire feeling I want our home to have this summer. I took a few pictures in our bedroom. 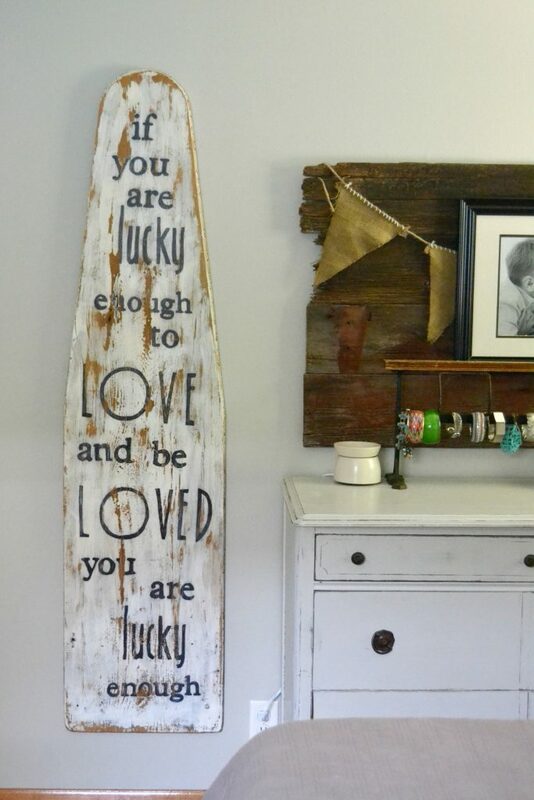 I hung this Vintage Ironing Board Sign in there. I thought it was very fitting there. This is what summer is all about. We had been at the pool all afternoon and she came in our room to rest. I love when they do this. Summer is for relaxing, loose schedules and fun in the sun. What is your favorite thing about summer? Do you change your decor during the summer months? So many fun things to check out in your tour, Lindsey. I LOVE that sofa. I totally get why you get some many compliments on it. 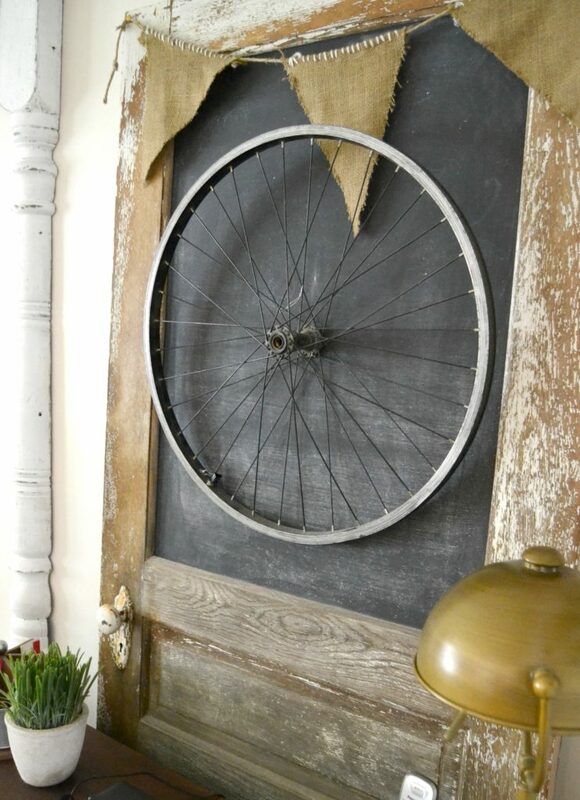 That wheel you have on that chalkboard is too cute! Thanks for sharing. 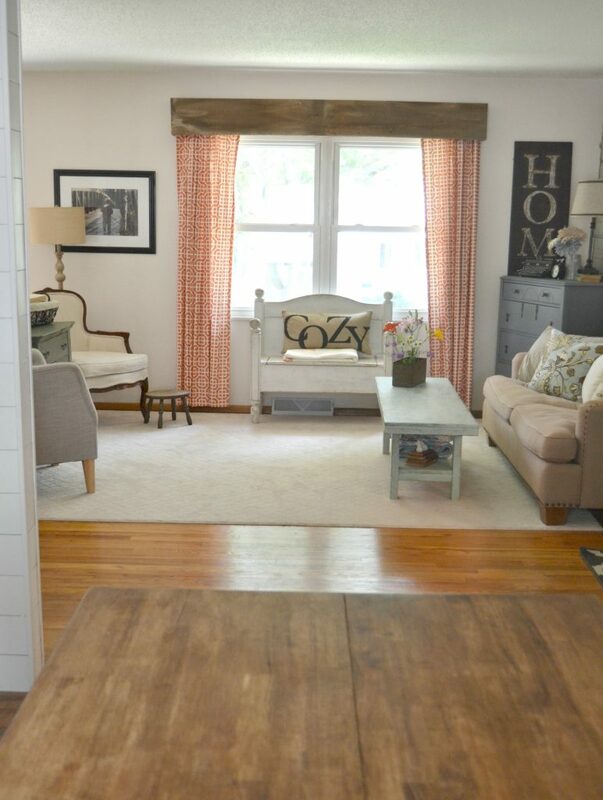 Love your home Lindsey….it is so inviting. 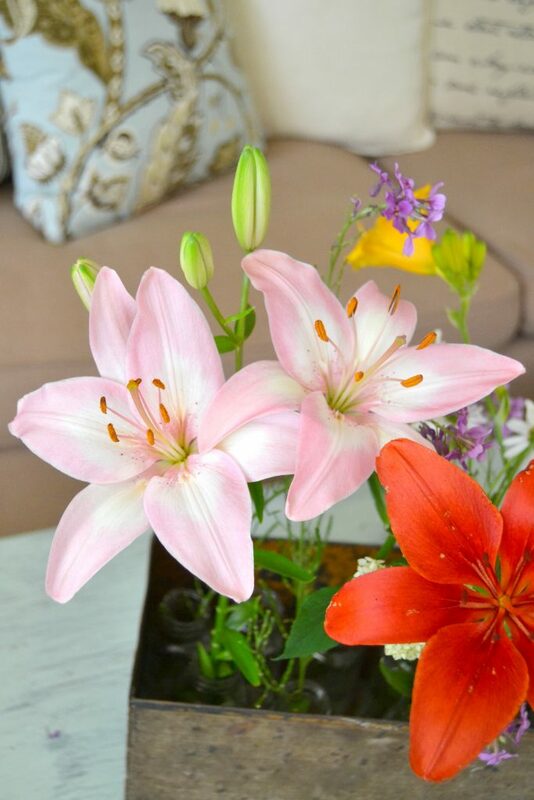 The flowers from your garden are beautiful. Thanks for inviting us in. 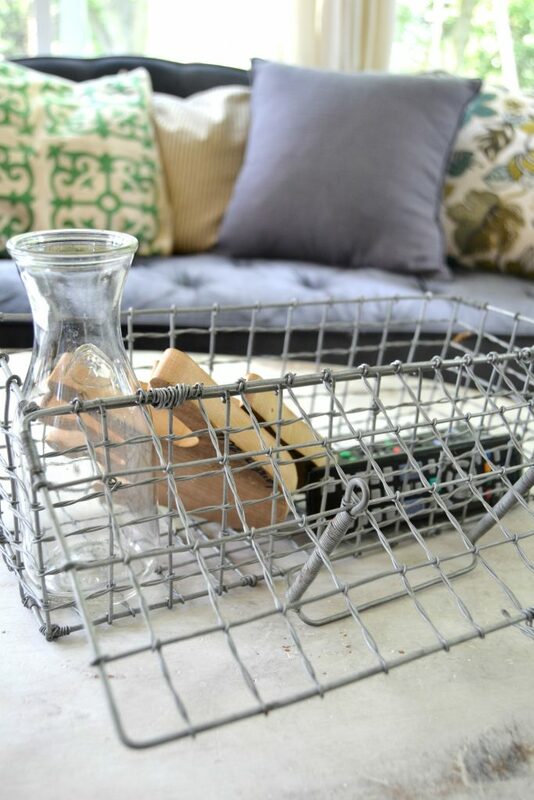 Your house is so fun, I love all of your thrifty finds! I’d love to read the “where did she get it” post! Can’t believe you got a couch from TJ Maxx, what a lucky find! I know! It was a lucky find! Our store used to have couches all the time. Not so much anymore. Need to get cracking on that post! 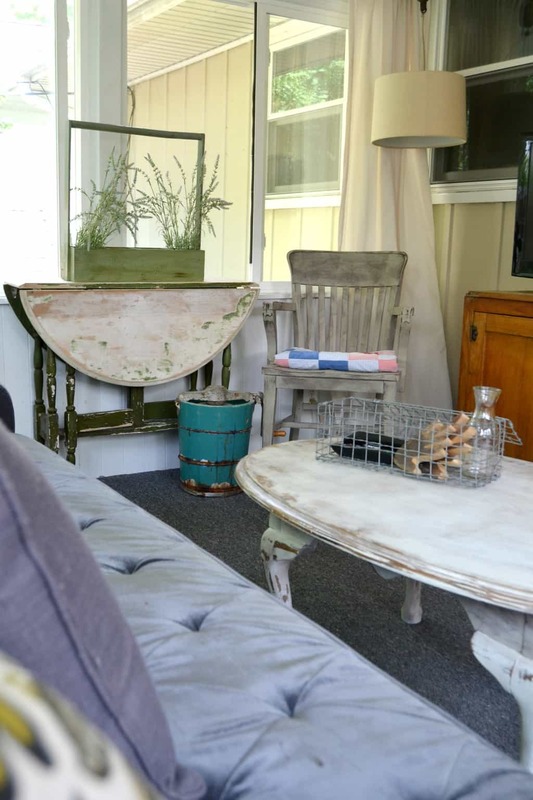 Your back porch looks really cozy – definitely achieved the look you were going for! Oh my goodness! Where do we begin? We love it all. You are so super creative and it shows with all of your personal touches throughout your home. 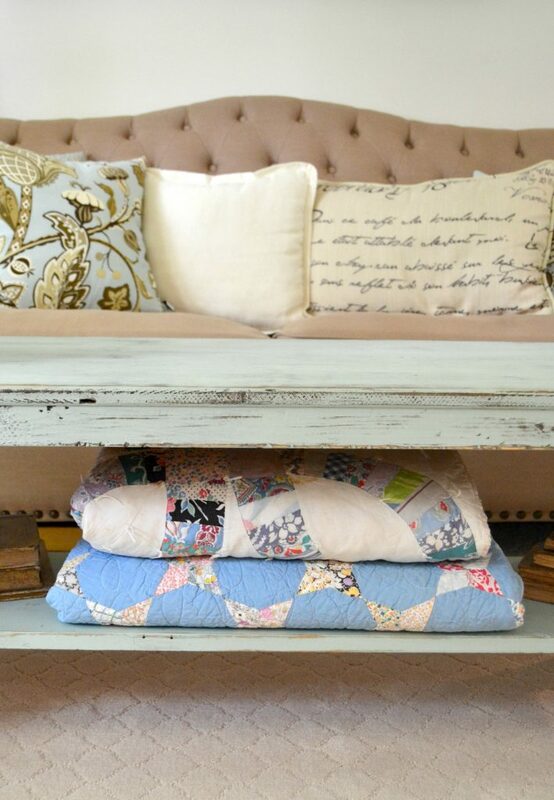 The ironing board and cozy pillow are definite faves! Great tour! Ok, I’m not sure if I’ve ever seen your home!? Boy, have I been missing out! Your decor is beautiful. I love the neutral background and you’ve used color beautifully. Similar to my style, I love how you have unique pieces that aren’t cookie cutter. Love your tour!!! Beautiful, beautiful, beautiful! That’s what comes to mind when I see all of your spaces! Love to see another frugal shopper too! I tend to wait until an item is on sale, or go to the outlet mall for my larger pieces of furniture, because I couldn’t ever justify the costs of some of the pieces I got if they were full price. Thanks for sharing your home with us on the tour!! So beautiful! 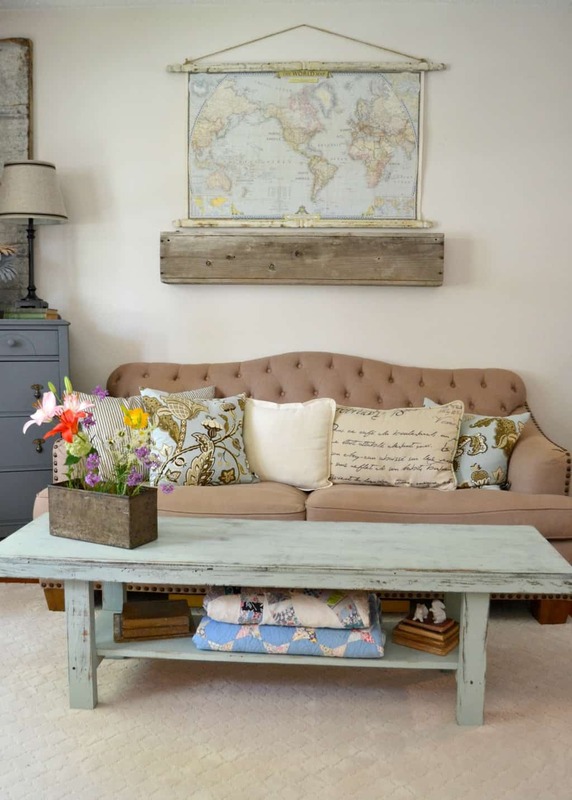 I love love love your coffee table and desk!